We have lived in our home for several years now and each year I pick a new room to renovate. First was Birdies nursery, then Boyce’s nursery, then our kitchen, then Birdie’s Big Girl room, and finally…drum roll…our master bedroom! That might seem like a very odd order, but honestly, before kids, we were never home, so we didn’t care too much about investing in our space. When I found out I was pregnant with Birdie, I immediately started in on her nursery and we have pretty much had a kid every year since…so those rooms were prioritized and now, in 2019, here we are, finally getting an upgrade! Shout out to Baxter’s mom who did choose some great bedding back in the day. So, here is what we did: we got ALL new bedding. 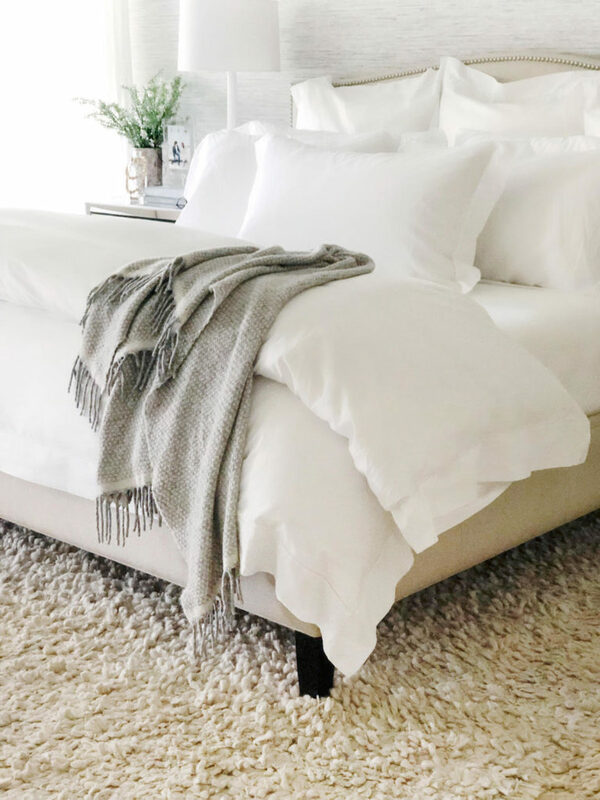 From the duvet to the pillows to the mattress pad – we got rid of EVERYTHING and started over. 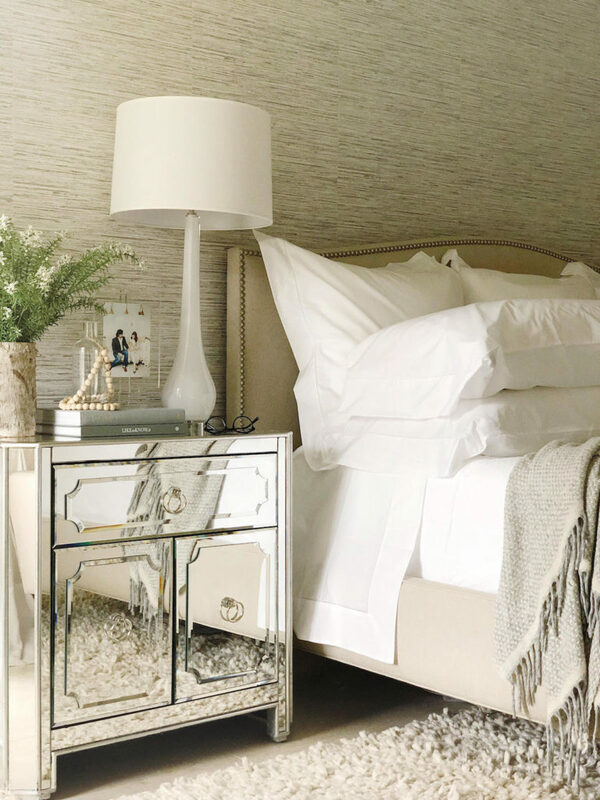 I love Birdie’s all-white sheets, so we did the same, and chose the SFERRA Giza 45 Percale collection. I really wanted clean lines and a timeless look, and I decided to replicate the Giza 45 catalog picture on the SFERRA site. I was shocked by how lightweight and smooth these sheets are! 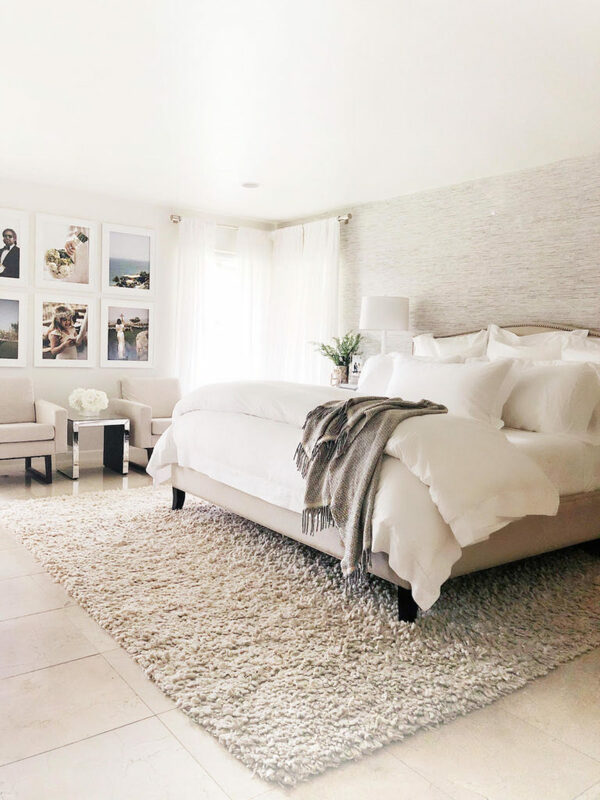 I used the Corino blanket, just like Birdie’s, to add a little texture, and kept our Tria throw in the master bedroom as well. Our room has white walls, so I installed some grasscloth style wallpaper behind the bed to create some depth in the room. At first, Baxter pushed back but once it was up, he really loved it. 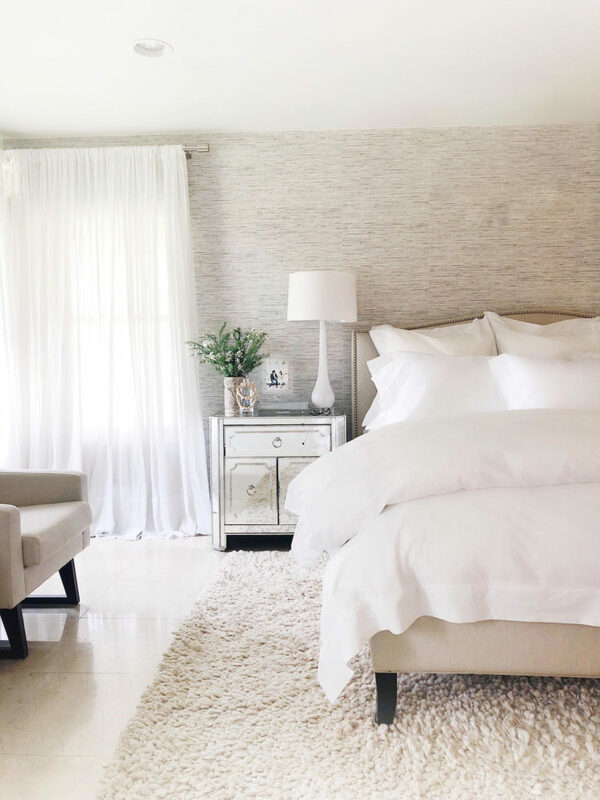 The texture of the wall contrasts the bedding and gives a bit more warmth to the space. Thank you to SFERRA for partnering on our master bedroom facelift!